Many people take back health for granted until they have an episode of some form which results in strained back muscles. Only after they have spent a few miserable days trying to find a comfortable way to sit, stand and walk do they begin to appreciate how much their back muscles factor into even basic body movements. Of course, it is possible to sprain back muscles in a variety of ways including a sports injury or a fall, however, in this article, we will focus on one of the more preventable ways to avoid straining back muscles, which is to learn proper lifting techniques. With consistent use of these techniques, the average individual will greatly increase their chances of avoiding a debilitating back pain episode. 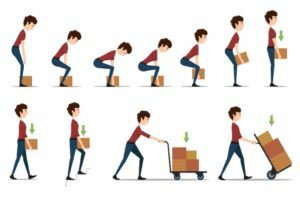 Young people who are very physically fit are typically able to do very physical work such as moving furniture into a dorm room or taking a summer job working in lawn care or furniture delivery. Although a young, physically fit person is not entirely immune from incurring a back injury, those most likely to develop weak back muscles are older and much more sedentary. Over time, a sedentary lifestyle leads to weakened muscles throughout the body. Weakened muscles lead to poor posture habits, which further degrades key back muscles involved in lifting such as the paraspinal, along with the glutes (buttock muscles) and transverse abdominis muscles. The classic scenario of a back injury involves someone who spends their entire week working at a desk job and then decides to take on a weekend warrior project such as yard work, cleaning out the garage or basement, or helping an older child move into their dorm room or first apartment. In most cases of injury, the episode produces temporary muscle spasms or a sprain, however, it is possible to incur more serious damage such as a herniated disc from engaging in improper lifting. It’s always a good idea to make it a habit to use proper lifting techniques. The young and healthy can benefit from learning proper lifting techniques since even they can come across a formidable lifting situation on occasion. Learning proper lifting techniques is especially important for anyone who knows they have a “bad back” or if they lead a sedentary lifestyle. The first step in lifting the right way is to check to see how heavy an item is before even attempting a move. If the item is very heavy, use the buddy system. 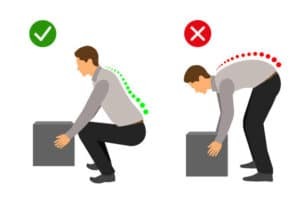 It may take an additional person or two to move a very heavy item and that’s ok. For those who know they have a vulnerable back, it’s always a good idea to wear a lifting belt. Even if a person feels fairly confident about their lifting ability, it’s still a good idea to wear a belt if they know the task will involve multiple lifts. The actual lifting process involves not just the glutes, paraspinal and abdominal muscles, it also involves the muscles in the front and back of the thighs (quads and hamstrings), along with the biceps in the arm, and muscles in the forearms and hands. The most important step in proper lifting is to bend the knees and lift from a squatting position. Never lock the knees and try to pick something up by bending over from a standing position. From a squatting position as close as possible to the object, grasp the object with both hands, bringing it close to the body. Maintain good posture by keeping the back perpendicular to the ground. Use the motion of straightening the legs to actually lift the object, while also tucking the stomach inward, activating those transverse abdominis muscles that are so important in core stabilization required for proper lifting. If you would like to know more about how to avoid a back injury from lifting, please contact us at: 570-208-2787 or email us at: cawleyptfrank@gmail.com.